(AP) BETHESDA, Md. - Congressional reopened its gates Sunday to thousands of spectators who got what they expected in the AT&T National  another win by Tiger Woods. Only this win didn't follow a typical script. Caught in a tense duel with Bo Van Pelt on another sweltering day, it looked as though Woods blinked first until Van Pelt matched him with mistakes of his own. Woods closed with a 2-under 69 and won by two shots when Van Pelt finished with his third straight bogey and had to settle for a 71. Woods won for the third time this year, the most of anyone on the PGA Tour, and it was the 74th win of his career. That moved him past Jack Nicklaus into second place on the tour list, eight short of the record set by Sam Snead. Woods, who finished at 8-under 276, moved to the top of the PGA Tour money list and the FedEx Cup standings for the first time since September 2009. He effectively clinched the win with a 9-iron down the hill toward the peninsula green on the 18th, a shot so pure that Woods started walking and twirled the club moments after he made contact. And so ended a wild week in Washington  record heat Friday, followed by a wind storm that topped dozens of trees at Congressional and forced the tournament to keep spectators out Saturday. They were back in force for the final round, and they were treated to some pretty good theater. "What an incredible week," said Woods, the host of the AT&T National and a winner for the second straight time it has come to Congressional. "Everybody, thank you for being patient with us. Yesterday was a silent day. I think everyone saved up for today. What an atmosphere to play in front of." There wasn't much to cheer in the final hour except for the 15th hole, when Woods holed a 20-foot birdie putt that crawled into the front of the cup, and Van Pelt matched that birdie with a 10-footer as the pressure was building. Van Pelt had him on the ropes on the par-5 16th by ripping a 345-yard tee shot and having only a 6-iron into the green. Woods hit a spectator in the left rough with his tee shot, laid up, and then attacked a back flag only to see the ball tumble over the green and down an 8-foot slope. That's when Van Pelt answered with unforced errors of his own. His 6-iron was heavy and didn't quite reach the bunker, meaning he had to plant his feet in the sand and grip the wedge on the shaft. He moved it only a few yards, still in the collar of the rough, and chipped about 12 feet by the hole. Woods' chip up the slope rolled 15 feet by, and he missed the putt to end his streak of 41 straight holes without a bogey. Van Pelt also missed his par putt, and they walked away from that mess still tied for the lead. On the 17th, Van Pelt caught a flier from the first cut of rough and the ball shot over the green and near the grandstand, leaving him an impossible chip. He hit through the green and had to scramble to make bogey, and Woods took the outright lead for the third time all day  this time for good. He made a 6-foot par putt, taking a one-shot lead to the 18th, and played it to perfection. Brendon de Jonge of Zimbabwe, who had a one-shot lead going into the final round, didn't make birdie and closed with a 77. Adam Scott went out in 31 and was briefly tied for the lead until a few bogeys on the back nine. He had to settle for a 67, which put him alone in third at 5 under. Billy Hurley, the Annapolis graduate who spent five years in the Navy, closed with a 72 and tied for fourth along with Robert Garrigus (70), Jhonattan Vegas (71) and Seung-yul Noh of South Korea, who had a 73. Woods has three wins, all of them in a different manner. He pulled away early at Bay Hill and played efficiently for a five-shot win; he rallied from four shots behind with an incredible chip-in late in the round and won the Memorial. This was a two-man duel he hasn't experienced in America since he was on the losing end to Y.E. Yang in the 2009 PGA Championship. Woods remains at No. 4 in the world, though this win at least gives him a mathematical chance to get back to No. 1 at the final two majors of the year. One day after spectators were kept out of Congressional because of debris from the wind storm, they returned by the thousands. The marshals were back to work, collecting a half-dozen cell phones from fans who were caught taking pictures. Yes, everything was back to normal  including the guy in the red shirt. There was a five-way tie for the lead at one point, though it took only nine holes to turn the final round into a two-man race. Scott, who overslept Thursday morning and made it to the tee with only minutes to spare, ran off four straight birdies late on the front nine to reach 6 under. But after making three tough par saves on the back nine, he ran out of luck. Back-to-back bogeys took him out of the game. "The story of my year. I need to try and play well for four days," said Scott, who opened with a 75. "You can `if' and `but' and you can argue, but my 3 over through three was due to my very brief warm-up on Thursday, and that might end up being the difference between winning and not this week. I only have myself to blame." De Jonge, a 54-hole leader for the first time, didn't last very long atop the leaderboard. He pulled his tee shot into the left rough on the third hole for his first bogey, and then made four bogeys in a five-hole stretch around the turn. That made him nothing more than a spectator for the duel between Woods and Van Pelt, one player with more than 70 career wins and another guy whose only official PGA Tour win came in Milwaukee, a tournament that no longer exists. On the golf course, they looked far more equal than their records indicate. 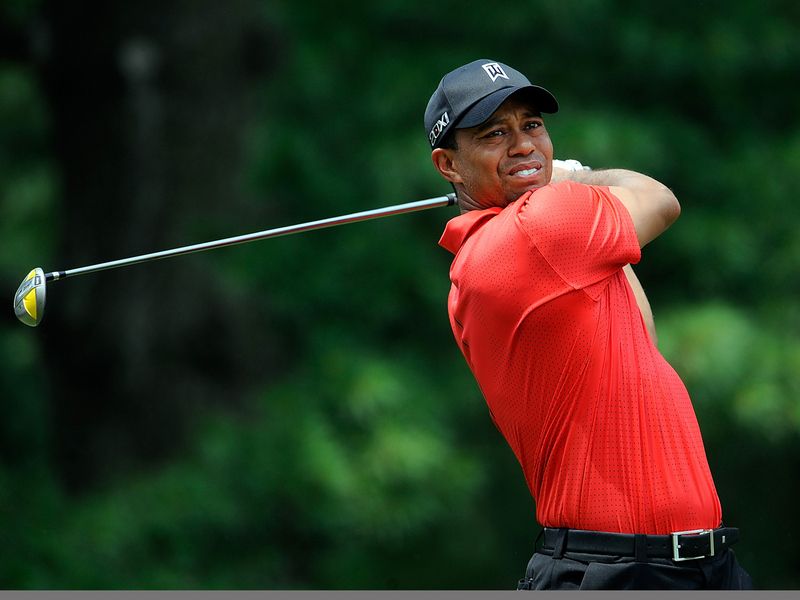 Woods twice took the outright lead with 10-foot birdie putts, on the fifth and ninth holes. Van Pelt caught him both times, with a long two-putt birdie on the par-5 sixth, and a bold approach to a back left pin on the 11th to 6 feet for birdie. Woods delivered a made-for-TV shot on the 12th hole when his tee shot left and close to a tree. He couldn't follow through without hitting the tree, and he warned the gallery that the 9-iron might snap in half. Instead, the shaft glanced off the tree and bowed at impact, while the shot sailed toward the flag and settled 30 feet away. Van Pelt was simply efficient. He twice missed birdie putts inside 15 feet, but he kept giving himself chances. In the end, all he made were mistakes, which rarely works against Woods.